A rocky peak which forms the southeastern end of the Dickson Range west of Gold Bridge and north of Downton Lake. 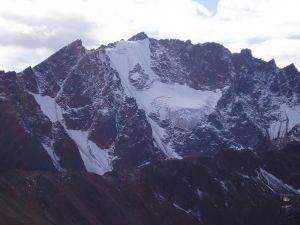 There is a small hanging glacier below the summit on the northeast side. There is a noticeable secondary summit of Penrose 2558m at the end of the ridge (50:52:37-122:48:08) which forms a cockscomb in a northwesterly direction from the peak, heading towards Dickson; there are other minor summits along this ridge, which gives Penrose a distinctive look from the direction of the Gold Bridge-Bralorne Road. Name Notes: Named after US Sen. Boles Penrose who was guided into this area in the 1920's by Bill Manson. He was a large man (overweight) and they had to shop all over the place to get a horse big enough to fit him and his custom saddle (Mike Kennedy). The horse was so large no other saddle would fit him. The horse was called "senator", and he was retired to the pasture because no standard saddle would fit him.